I am very aware of the issues with Sharp monitors disabling the RS232 port when the display is turned off. I have about 8 sharp monitors that will not turn on via RS232. I have sent the "'RSPW1 ',$0D" command several times. Once I even sent it via terminal. I got an OK command from the monitor so I thought it was good. Does anyone have any suggestions as to why I still can not get these tvs to turn on via RS232? The model of one is LC46LE. Try calling Sharp tech support and see if they have a firmware update. Also verify you have the correct protocol, i recall there being several different commands, some padded with spaces and others with 0's. You could search the forum to find commands used. I did several Sharp TVs before that needed to have the Power-saver feature disabled from the menu to allow the RS232 port to stay active. The Power-save/Eco-mode powered down the RS232 port. I recently deployed a bunch of these and had the same issue you did. A call to Sharp got me a firmware update that corrected the issue. I have the firmware for the LC46LE540U release if you need that version. Try sending "'RSPW 1',$0D" (thats 3 spaces before the 1 instead of after. I found a few Sharp displays that would respond to the way you're sending it after being turned off for <10 seconds, but after that only worked with the spaces proceeding the '1' instead of following. The off command doesn't seem to care though. I found this on one job, where the manual is literally identical in the RS232 section between 2 different models (can't recall exact models, but one was a 70" with a touch overlay, and the other (pair) were 80" LED lit models) the 80" were the troublesome ones, and of course the hardest to physically get to the DXLink receivers behind them to verify the correct commands coming out, etc. With different models from Sharp, there seems to be two major methods of including the spaces in the commands. The command format is the first four positions for the command, the second four for the parameter, followed by the CR. In most models, the parameter starts in position 1 with trailing spaces. Not having the spaces before the CR will cause it not to work. Recently I had a model that required the parameter to be right-justified with leading spaces. This was for the PN-L702B model. I also remember another model I used 6 or more years ago that used leading zeroes instead of spaces. It turned out to be a firmware issue in the Sharp monitor like what Jeff said. Having the same problem here... Where did you all end up placing the RSPW command in your mainline? Did you have to insert it before every power on string? No, you need to send the string to the unit with the unit powered on and you only need to do it once. If the unit is not on, it will not accept the string. If you got it to accept RSPW1 with RS232 and then want to use IP instead, you probably have to get it to respond to RSPW2 while powered on to get it to accept the power on string. In your other thread on this issue, you have code with strings starting out with $02 as if this were a Panasonic. Cut out that $02. It's not called for in the protocol and could screw you up. I've never tried sending stray characters to one of the Sharp monitors, but I doubt they like it. As others mention, these units will work on RS232 if you are setting them up properly and sending the proper strings. Because you got the unit to respond to one of your strings with an OK, it's probable that you are wired up correctly. That is if you actually sent the string through the AMX rather than with the device connected to your PC. If that's so and you can't get a properly formated power on string to work after a proper RSPW, then firmware may be the solution. Now this is the kind of help I needed! simultaneously, then connect the AC power cord. ３. 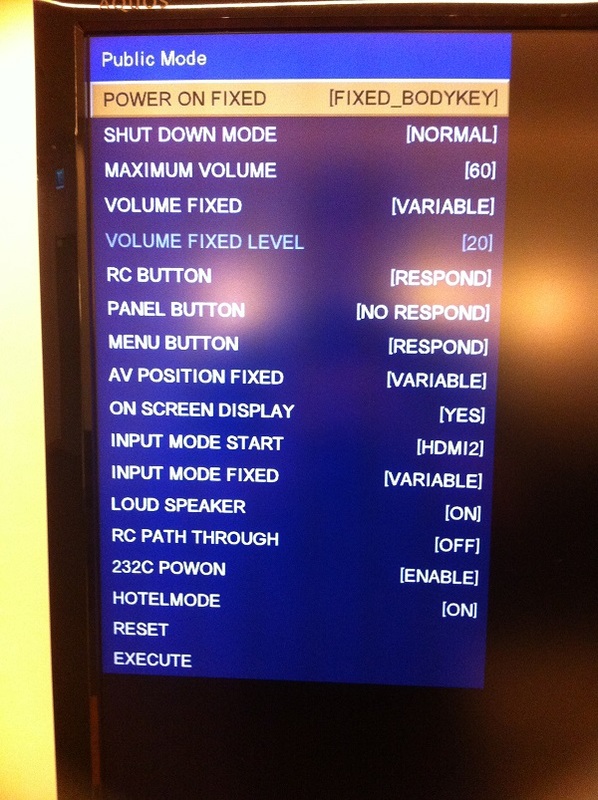 Hotel mode input screen is displayed on a LCDTV. ４. “027” is required to key in by the Sharp remote control. ５. “Public mode menu” will display on the screen as per below. as per note in red below. applicable only if this menu is included under Public mode menu. ８. Highlight “Execute” and press Enter key on R/C to save the settings. on model of the LCDTV instead of less than 1W as per original specification from Sharp. Another thing about the Sharp TV's is that if you leave the setting for the side power key as default, it can mess up power status tracking within your code, as the side power can turn the 232 port off, even though you send the correct commands. I experimented with many different combinations and eventually came up with the ones I've attached to this post that has been stable for the last 2 years. Don't be afraid of leaving hotel mode enabled if it's in a residential install, there is plenty of granularity in the options to still let the user play with menus etc. This setup disables the buttons on the side of the TV, but that was because cleaners were trying to use the TV out of hours and messing things up more. One thing we constantly get is that the audio on the HDMI inputs can drop out and will not return until the Sharp TV is power cycled. It was happening before I set the options in the hotel mode, so it's more than likely the TV itself. I've got the actual service manual for the Sharp Aquos if you want a copy, let me know. 4. When you see three "underbars" on the screen release the buttons. 5. enter the password "027". Scroll to "ENABLE RS232 OFF". Highlight this and change to "ON". 7. Not all of the Sharp LED's have this particular feature but I have seen that most do.